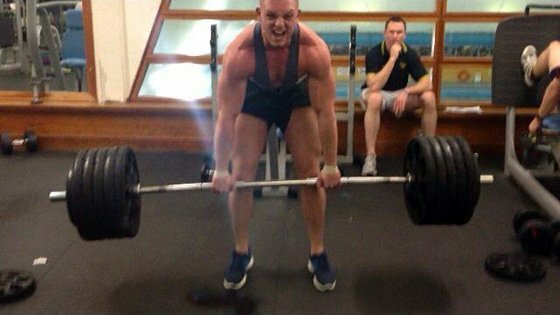 Amateur Bodybuilder Of The Week: Strong Minds Build Big Bodies! Anthony embraces his amateur status in the gym and in life. He realizes there's room to grow mentally and physically. See where he started and where he plans to go! I started working out at age 19 to build muscle because I was tired of being thin. So I got a gym membership, visited a supplement shop in my area, and became friends with the guy behind the counter who helped and still helps me today. His name is Tommy Staunton, the 2013 NABBA Mr. Universe and NABBA Mr. World Class 4 Champion. With the right combination of guidance and resources, I understood more about training, supplements, and nutrition. Within 10 months, I went from 152 to 198 pounds and started my contest prep for the NABBA Mr. Ireland. As a personal trainer, I tried everything: boot camps, strongman training, and suspension training. What worked best for me was a split workout routine for the week. It yields constant gains when done correctly and allows you to pinpoint weak areas, which is extremely important for any bodybuilder to achieve an aesthetic physique. The plan works great with some advanced techniques like supersets and trisets. When I started training and corrected my nutrition and workouts. I saw the results appear and I fell in love with the challenge to create a physique with the image I had in mind. Once you make your mind up, the changes fall into place and it becomes completely up to you. At my first show, I got an adrenaline rush from the bright lights, big crowds, and the support and positive feedback. After that, I couldn't imagine not competing again. I hated being small and loved physical sports. I was a competitive boxer, and enjoyed soccer and GAA (Irish rules football), but my lack of strength always held me back. Watching my physique change and seeing my friend compete in Mr. Universe and Mr. World motivated me to do the same. If there was a day I didn't feel like working out, I visited my barber who filled my head with quotes from positive thinking books. I will always remember him saying: "When we are born, we're all born rocks. It's not until we learn how to cut those rocks into diamonds that we figure out what it is we need to do to shine." I know it sounds silly, but it applies to people in all walks of life. For inspiration, I visited my friend's shop and asked bodybuilding-related questions about shows and what it was like. My future plans are to represent my country on an international stage, but for now I'm concentrating on the NABBA Mr. Ireland this September where I hope to place first in the junior class. From there, I want to repeat at the RIBBF National Championships. When I get there, I'll worry about my plan to represent Ireland on a larger stage. I'm a newly-qualified personal trainer and hope to open my own studio by the end of the year so I can help others achieve their fitness goals. Thoughts become things if you beat the message into your head that you will go far in life. Negative energy leads to negative results. Enjoy yourself and be happy with your accomplishments. Your body is a mirror of your mind. If your mind changes, your body will too. Kai Greene. His dedication and mindset are unbelievable. The articles on Bodybuilding.com are amazing. I read about contest prep and nutrition plans. Trying different methods helps me discover what works for my body. It's good that Bodybuilding.com has a wide range for every fitness topic.